You've probably seen the image above floating around as a possible vision to protect Lower Manhattan from future storms, but we could actually see something very similar come to fruition soon. 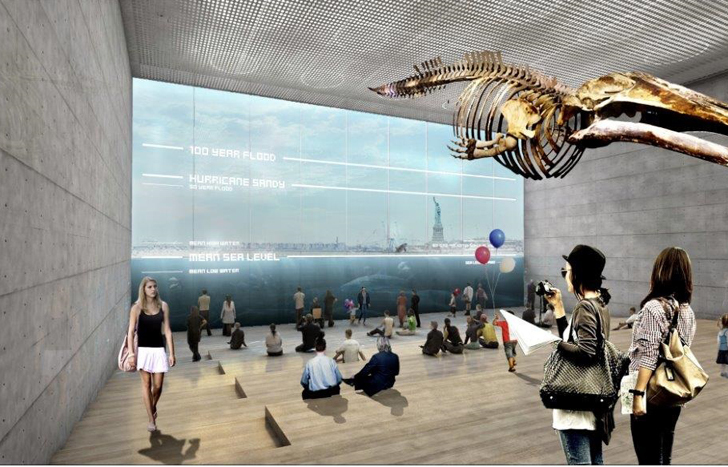 The design, by <a href="http://big.dk/#projects-hud">BIG Architects</a>, was recently awarded $335 million as part of the <a href="https://inhabitat.com/nyc/wxy-and-west-8-begin-talks-with-science-experts-to-protect-nyc-from-floods-using-barrier-islands/" target="_blank">"Rebuild by Design"</a> competition to find resiliency solutions for New York and New Jersey. 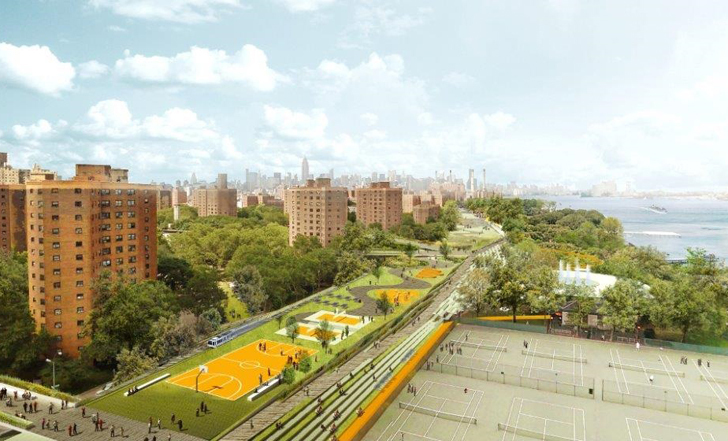 The plan, called Big U, was chosen along with five other winning designs, and centers on a multi-use strip that encircles the city’s flood zones while also creating new green space for New Yorkers to enjoy. 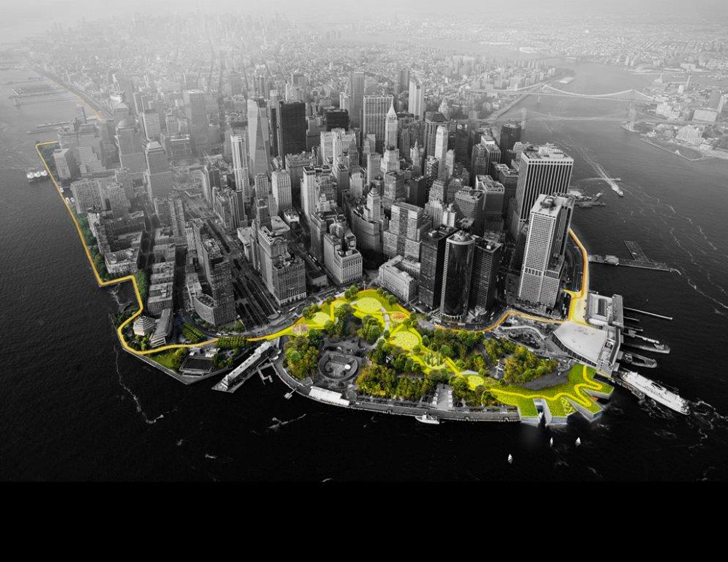 Big U would not only tackle Lower Manhattan, but would extend to the <a href="https://inhabitat.com/nyc/nycs-flood-protecting-seaport-city-project-selects-netherlands-based-arcadis-as-feasibility-consultant/" target="_blank">known flood zones</a>- up to 57th Street on the west side, down through Battery Park, and up to 42nd street on the east side. 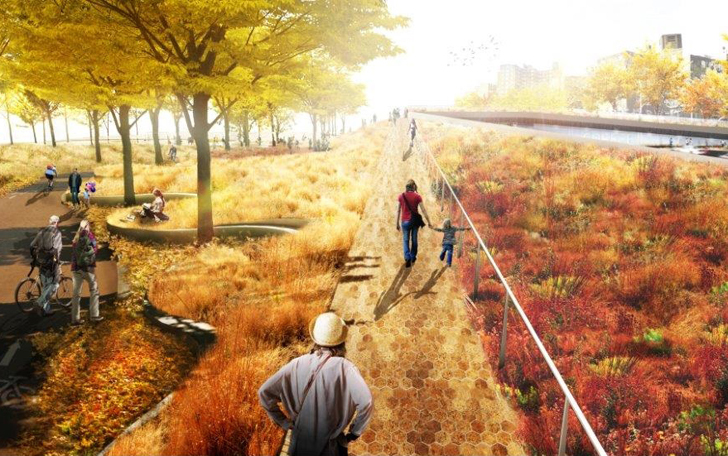 The plan will encompass ten miles of low lying land throughout Manhattan, enacting a flood-protection infrastructure woven into public developments. The flood protection facet will be divided in three compartments, which can each be isolated during storm surges so that one overflow will not affect the others. These zones will be strung together around Manhattan, strung together with a new social infrastructure. Along with these <a href="https://inhabitat.com/nyc/genslers-flood-preventing-town-squares-could-protect-nyc-against-storms-and-generate-alternative-energy/">discrete flood protection zones</a>, Big U envisions lush green spaces that connect one compartment to the next, based loosely on the High Line Park’s oblong plan. 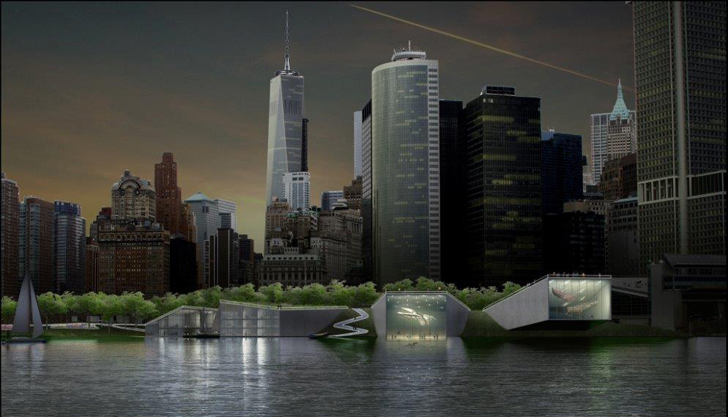 BIG has also envisioned outdoor water park areas, a new aquarium, and even a lagoon-style park area for local fishing. 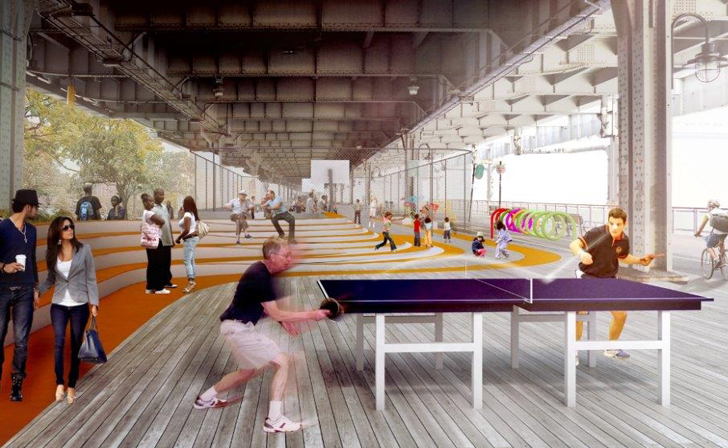 The exciting plan is an example of BIG’s Social Infrastrucure, which fuses a resilience infrastructure with the opportunity to create social and environmental amenities for the community to enjoy. You've probably seen the image above floating around as a possible vision to protect Lower Manhattan from future storms, but we could actually see something very similar come to fruition soon. The design, by BIG Architects, was recently awarded $335 million as part of the "Rebuild by Design" competition to find resiliency solutions for New York and New Jersey. 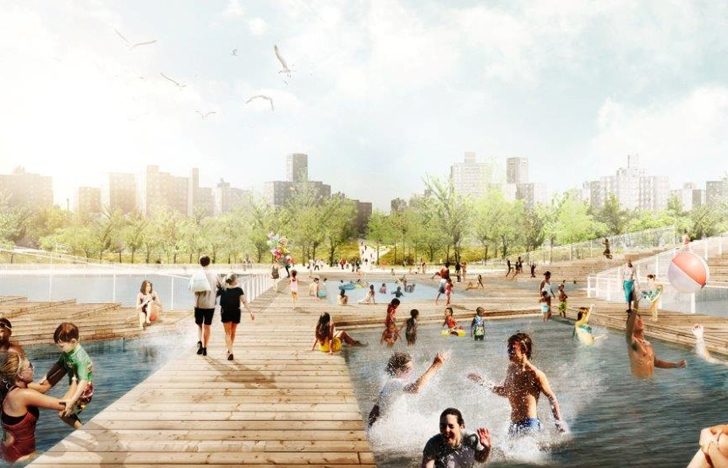 The plan, called Big U, was chosen along with five other winning designs, and centers on a multi-use strip that encircles the city’s flood zones while also creating new green space for New Yorkers to enjoy.